It's officially winter where I live in the midwest. A huge snowstorm with over 4 inches of snow brought in the first "real" cold of the season. 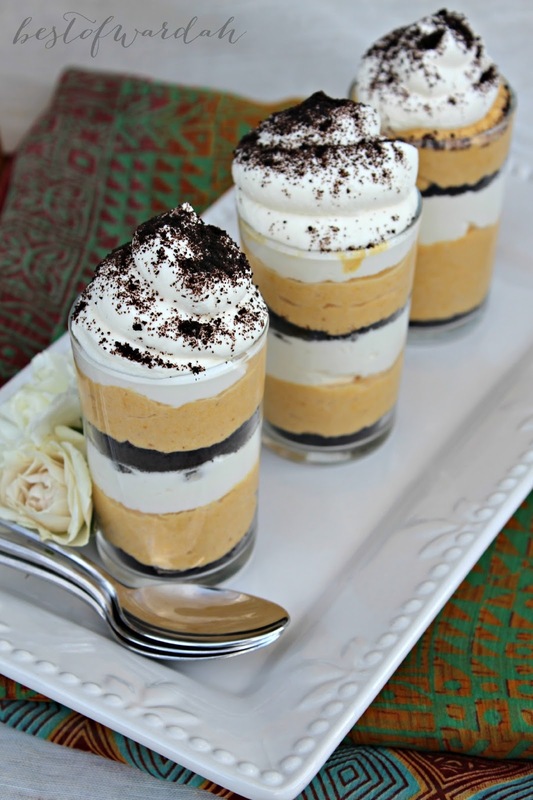 So these pumpkin parfaits are a sore reminder of the beautiful sweater weather of the past few months. 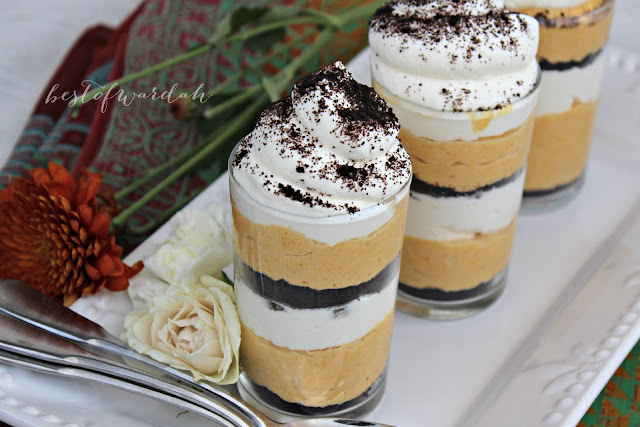 I made these pumpkin parfaits a few weeks back in honor of fall. Now that Thanksgiving is right around the corner I thought it would be the perfect time to share the recipe with y'all. This pretty dessert tastes as good as it looks. The crumbled chocolate wafer in between layers of pumpkin and vanilla flavored mascarpone is the perfect flavor combination. It is also a stunning dessert to serve at a dinner party in individual sized treats or in a larger layered trifle. 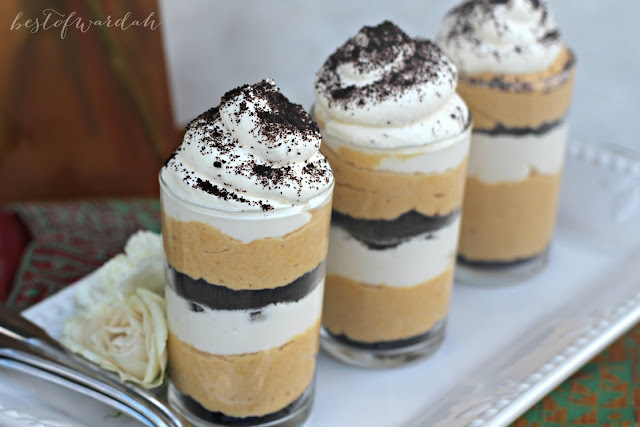 The key to getting the layers even is using a piping bag to pipe the different layers of the dessert. 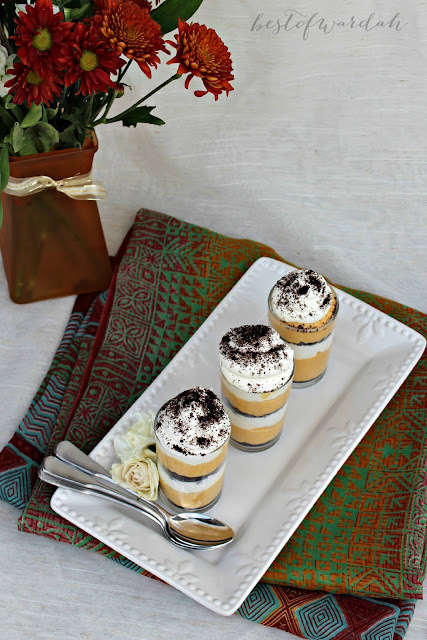 Now this dessert may not be for everyone, but for a pumpkin lover, its a dream come true. Whip the heavy whipping cream until soft peaks form and set aside. In a large bowl, beat together the pumpkin puree, 8 oz of mascarpone cheese, 3/4 cup powdered sugar, pumpkin pie spice, salt, and cinnamon until well combined. Gently fold in half of the whipped cream. Adjust spice and sugar to taste. In another bowl, beat 8 oz mascarpone, vanilla extract, and 1/2 cup powdered sugar until well combined. Fold in the other half of the whipped cream until well combined. Adjust sugar to taste. Fill both cream mixtures into separate piping bags or ziploc bags with the tips cut off. Alternately layer the creams and cookie crumbs to fill serving glasses. Top with cookie crumbs and serve. Keep refrigerated for 2-3 days.